Just in the heart of Istanbul’s Beyoğlu neighborhood, on the European side of the city, sits The Galata Istanbul Hotel - MGallery by Sofitel. This historic hotel is situated directly between the Galata Tower and the Golden Horn, and guests will find it offers ideal access to the most celebrated areas of Istanbul. The hotel bears traces of its past and present, hinting back to when part of the hotel was used as a Turkish bath house in 1720, as well as its use in the 19th century as a major bank that financed the Ottoman Empire. Recently, in 2017, the two historic buildings were combined by a courtyard and underwent a major transformation into a hotel, while maintaining the distinct features of the historic bank and spa in respect to its former uses. 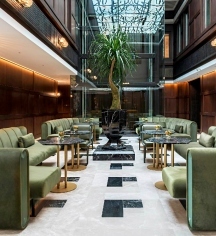 When visiting The Galata Istanbul Hotel - MGallery by Sofitel, guests will be charmed by the magical feeling of the Galata district and the hotel itself. With 83 luxurious and uniquely-styled guestrooms, The Galata Istanbul Hotel offers a warm atmosphere and friendly service to all who visit. Among the amenities at the five-star hotel are a rooftop bar, modern, Turkish-inspired restaurant, and traditional Turkish baths and spa. Truly an exceptional setting, the hotel offers proximity for those wanting to explore the city, and tranquility for those looking to relax. The Galata Istanbul Hotel is nestled in one of Istanbul’s most historic areas, and guests will find plenty of locales to explore as they wander through the surrounding neighborhood and beyond. The Old City of Istanbul, the Galata Tower, the Blue Mosque, and other highlights of the city are located within an easy walking distance of the hotel, while the Beyoğlu district offers guests an array of theaters, restaurants, and boutiques to discover. 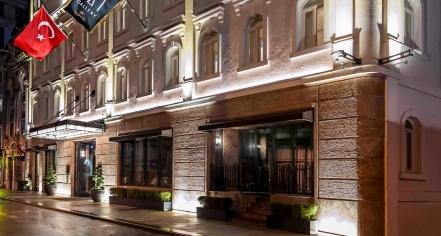 The Galata Istanbul Hotel - MGallery by Sofitel, a member of Historic Hotels Worldwide since 2018, dates back to 1720. The Galata Istanbul Hotel features a traditional Turkish hammam that dates back to 1720 and is still in use today. Airport Transportation: Cancellations can be made free-of-charge before 6:00 p.m. Cancellation Policy: Cancellations can be made free-of-charge before 6:00 p.m. Learn more about the History of The Galata Istanbul Hotel - MGallery by Sofitel .